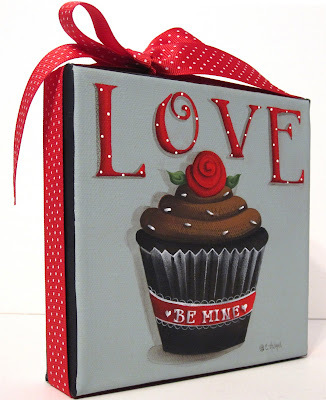 I listed this little 6 inch x 6 inch Valentine painting on eBay today. You can view it here. I have some good news that I would like to share. I now have a licensing agent and my very first contract to license a couple of my designs. This is a journey that I've long wanted to take. Sometimes it's hard to take that next step, but that was my one and only New Year's Eve resolution. Now I can check that off my list! You can view my artwork on their website "Next Day Art". This very rich dark chocolate fudge cupcake is topped with milk chocolate frosting and a bright red rose. 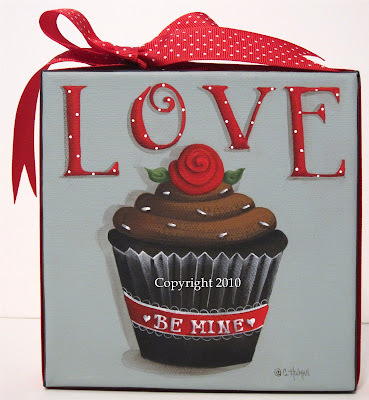 Tiny white sprinkles are an extra little touch and a red, "Be Mine" ribbon is tied around the base of the cupcake. Love is spelled out in red at the top and accented with tiny white dots. A red and white dotted grosgrain ribbon is wrapped around the edges of the canvas and tied in a bow at the top. Cathie, I love that cupcake! I'll have to tell my daughters about this one-they love chocolate cupcakes! Wow good news on your licensing agent, Love the cupcake. Congratulations! That's wonderful... Hope that you have the "next thing" already on "the list" because it looks as if this is the year for you! This painting is so delicious looking. I am so very proud of you and all of the hard work and long hours that you put in. A perfect painting for Valentines day! And congratulations on the getting your art licensed Catherine, you deserve to be noticed much more! that is so lovely. I love the polka- dots in the "LOVE"- writing. Congratulations!! You must be so excited. I'm going to check the link. The cupcake is wonderful! Love it! I love this cupcake! And congratulations! Thanks for the link! Hi Catherine, I love your valentine cupcake..it is just wonderful. Yum, I love this one! Congratulations on achieving such a wonderful goal! Your work is lovely and this will be an awesome way to get yourself out there more! How funny that you also have a Jersey! How did you decide on that name? Our kittens came in a pair and so I decided to name them Callie(because my girls were all born in California) and Jersey(because my husband was born there). I named them before I even saw them and when we got them, the names fit perfectly! Callie has calico coloring and Jersey is the colors of a Jersey cow! Congrats on your licensing. That's wonderful! Thank you Catherine, for the lovely thoughts you left on my blog, I really appreciate it. And I LOVE the cupcake - WOW! Fantastic work. Sounds like your work is "working" ! Congrats! I won this Print last week and it arrived Yesterday! Very fast shipping to make it so quickly all the way to lil old New Zealand!